When Bo was a baby, her Mama “walked away”, leaving her to be raised by two burly gold miners, Arvid and Jack. Now she is five years old, and everyone at Ballard Creek is a part of her extended family. She jokes around with “the boys” and imitates their accents. The “good-time girls” dress her up and do her hair. She speaks Eskimo along with English, and enjoys Eskimo foods such as akutaq, which is made from caribou bone marrow and fat. This book takes place over one year at Ballard Creek and tells tales of Bo’s adventures large and small. These include seeing an airplane up-close, being chased by a grizzly bear, catching pneumonia and watching her best friend go to school while she stays home. Through it all, Bo remains a buoyant and carefree little girl enjoying her childhood in late 1920s Alaska. When I reviewed Ann M. Martin’s first Family Tree book back in April, Ms. Yingling left a comment on my blog which read, “I will have to read this, but I do wish that historical fiction would be more humorous and adventure filled. it is hard enough to get students to read it.” Though I apparently did not reply to her comment, I remember thinking that she was right. My main issue with historical fiction as a kid was that it was depressing and everyone was always getting sick or dying or suffering some other tragedy. This is why Bo at Ballard Creek was like a breath of fresh air for me. This is a kid-friendly historical fiction book that focuses on the day-to-day life of people in a particular time and place without dwelling heavily on hardship. The age of the main character makes this a difficult book to categorize. Most middle grade readers would probably be turned off by the notion of reading about a character so much younger than themselves, but early chapter book readers don’t yet have the reading skills to tackle much of the vocabulary. While this might make the story difficult to catalogue in libraries, it also makes it a perfect family read-aloud, similar in style and tone to books by Laura Ingalls Wilder, Carolyn Haywood, and Beverly Cleary. Young readers of all ages can enjoy the ups and downs of Bo’s exciting young life, and I think they are most likely to do so when the story is shared in a family context. I haven’t heard of any plans for a sequel, but I think it would be wonderful to have more stories about Bo as she ages, so that, like Ramona, she can grow up along with her readers. The writing alone makes Bo at Ballard Creek one of my favorite books of 2013, but the illustrations caused me to love it even more. LeUyen Pham, who also illustrates the Alvin Ho series, brings Bo’s world to life in her pen and ink drawings, which are scattered generously throughout the text. She is one of my favorite illustrators, and her pictures for this book are full of life and personality which helps immerse the reader in the unfamiliar but thoroughly interesting Alaskan setting. Pham’s artwork helps the reader keep track of the large cast of characters and also provides the necessary visual context young listeners need to help them stay focused on the story as their grown-ups read it aloud. 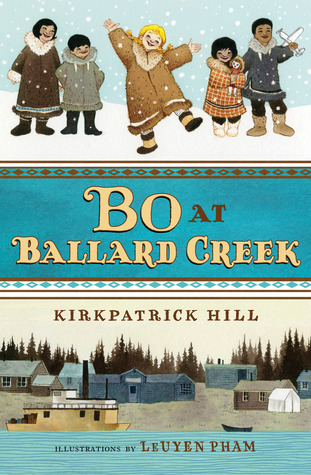 Author Kirkpatrick Hill based much of Bo at Ballard Creek on her own personal experiences growing up in Fairbanks, Alaska, which makes the book not just entertaining, but also reliable and authentic. Though I was not previously familiar with this author, I am pleased that she has written several other Alaskan tales for children: Dancing at the Odinochka, The Year of Miss Agnes, Toughboy and Sister, and Winter Camp, many of which look like more traditional middle grade novels. Share Bo at Ballard Creek with boys and girls ages 4-10 who enjoy light-hearted historical adventures, and incorporate it into lesson plans and programs exploring the state of Alaska.